This is taken from the world tour which took up much of 1981, which followed on the back of the successful release of the "Kings of The Wild Frontier" album in the Autumn of 1980. I think this was also the soundtrack to a long deleted VHS video of the gig. It still needed a bit of work to bring out the sound quality but really responded well to some studio magic. 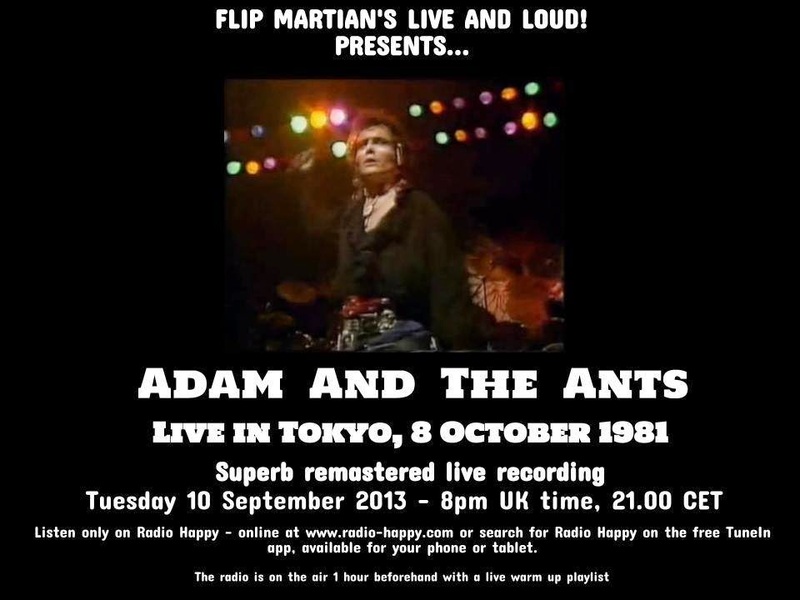 Its a great record of the Ants live, driven by the powerhouse of 2 drummers, and complete with screaming audience! While preparing this old show as separate files for a donator to the site, I found I could now improve the sound quality further, over what I’d originally done to the recording back in 2013. You can now download this new version (as of 2018) HERE as 1 new 320kbps MP3 file. Ignore the links at the end of the show, which are long out of date - as you know you can see a list of all shows that are available, right here on this website. If you would like to have separate tagged MP3s, or even lossless files in FLAC format of the new version, head on over to the Donations tab to see how you can obtain these for a very small donation towards the site costs. They are available in cloud space now, so can be delivered to you far more quickly. A band much beloved by my ex-wife & which now, with the pasage of time, nostalgically, I grudgingly admit to not minding at all. I don't have any currently but I'll add it to the list of ones to look for. Should be something going up in the next month or 2, yep!